Television Reboots: Anything Could Happen! Get ready Marshmallows, March 14th is almost here!! If you’re sitting there scratching your head wondering what the heck white, puffy confections that top hot chocolate have to do with anything, then you probably aren’t a fan of the UPN/CW show Veronica Mars. Even though the smartly written show about teenage detective Veronica Mars (Kristen Bell) had a cult-like following, ratings weren’t great and the network axed the show back in 2007. Fans tried to save it and Rob Thomas (not to be confused with the Rob Thomas of Matchbox Twenty fame) the show’s creator wrote a screenplay continuing the story, but the studio passed. It seemed that Veronica Mars was destined to stay in high school forever. Then in March of 2013, Bell and Thomas launched a Kickstarter campaign to raise 2 million to fund the movie. Marshmallows responded in a big way – the campaign reached its goal within TEN HOURS of launching and fans went on to give over 5 million to fund the project. The Veronica Mars movie will arrive in theaters one year and one day after the start of the Kickstarter campaign. So what does this mean for other TV shows that have long been dead? Firefly fans have been clamoring for a reunion for years, Fox is resurrecting 24 this summer for a mini-series and Chuck creator Josh Schwartz hasn’t ruled out revising the series in a movie or Netflix type reboot similar to Arrested Development‘s comeback last year. Obviously there are some shows that need to stay dead ( 15 seasons was plenty for ER) but there are many, many others that didn’t receive the kind of closure fans wanted and needed. Here are just a few that I personally would love to see make a comeback to either the big or small screen. 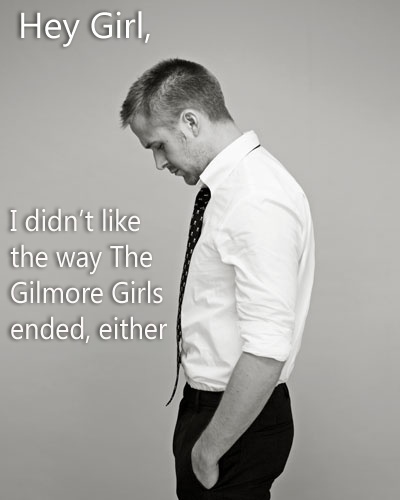 Gilmore Girls: Season seven (the show’s final season) was a letdown. Creator/writer Amy Sherman Palladino exited the series at the end of season 6 and all kinds of infuriating things went wrong . A movie idea has been thrown around in the seven years since the show went off the air and it would be great to see a return to Stars Hollow to tie up some loose ends. Heroes: Season 1 was incredibly good. Season 2, not so much. Although the remaining two seasons never quite recaptured the magic of season 1, it did start to get good again. The show was canceled at the end of season 4 and fans were left with a cliffhanger of a final episode. Netflix would be a good place to revive the show and at least give it a 13 episode series finale so fans could see how things were going to play out. The X-Files: 2008’s “I Want to Believe” was a poorly done movie. But Mulder and Scully remain favorites of mine and any return to the big screen would be exciting for long time fans. David Duchovny and Gillian Anderson have expressed interest and it’s pretty safe to assume Fox would be on board. Creator Chris Carter even has ideas in mind for a plot. Let’s get the ball rolling, guys! Firefly: BTVS will always be my favorite Whedon show, but Firefly is a very close second. Who couldn’t love a space/western where the characters curse in Chinese? Serenity was a great action movie that wrapped some things up, but it’s always felt like there were more stories to tell about Captain Malcom Reyolds and the crew. It’s highly unlikely that any sort of reunion will happen, especially since Nathan Fillion is occupied with Castle and Joss Whedon with the Avengers, but one should never say never. So there you have it – 4 shows I’d love to see make a comeback, even if only for a limited series run. Like my choices? Think I’m incredibly off base? Tell me what you think and what shows you’d like to see resurrected! Reading those materials also allows EAL student to help expand expand their English vocabulary. The mirror behind Henry revealed the opposite drinkers who sat on the tables Jake knew so well.